Chen was honored with the 2016 IEEE MGA Leadership Award. Engineer Yousu Chen recently received the 2016 Institute of Electrical and Electronics Engineers (IEEE) Member and Geographic Activities (MGA) Leadership Award. Chen was selected for the contributions he’s made to IEEE activities and the leadership he’s displayed in IEEE at the local, regional, and national levels. 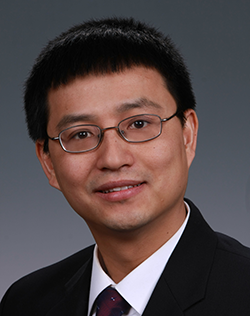 Through his leadership, Chen has helped increase IEEE member engagement and collaboration. In a congratulatory letter, Vice President of IEEE MGA Wai-Choong Wong noted that Chen has set a great example in carrying forward the goals and objectives of the IEEE MGA Board. Chen joined PNNL in 2006. His research encompasses high-performance computing applications, power system operations and decision support, and power system simulations.